First of all, I welcome you to our blog post on "Best Quiet Inverter Generators". Before we dive deep into reviewing the top quiet generators available in the market, we will be answering some of the frequently asked question related to today's topic. If you are also planning to buy a quiet inverter generator, they stay with us till the end, we will help you to buy the most reliable, cost-effective, value for money, and most importantly a product that caters to your requirements. It all started with the peace of mind. I made my room soundproof and added all the needed soundproof appliances in my home to get minimal distraction from the unwanted noise. I was very happy about moving to the new apartment that I bought recently but unfortunately, my happiness was short lived. It was the first time in my life when I was living near the airport and trust me, I had to put loads and loads of effort to soundproof my entire apartment. Anyways that is a different story. Today most likely we will be talking only about the best quiet inverter available in the market. This blog post includes the product review, buying Guide and also, the frequently asked question related to the topic. Needless to say, all the products reviewed in this post are either used by our clients or our team. We have tried our best to share our experience on this topic in the form of a mammoth article. However, if you are in hurry and only looking for the final recommendation, then I will request you to click the link and buy the product from the world's biggest e-commerce website Amazon. Most of us are aware of the fact that the inverter generators are the upgraded version of the conventional ones. If we talk about the working methods, functionality, cost etc, you will find a visible amount of difference in both the generators. For example, both the generators are used for producing electricity. But the dishing out property is different. The conventional generator only dishes out the AC current. At the same time, the inverter generator is made to dish out both the AC as well as DC currents. It is a known fact that the conventional generators are bulky as well as difficult to move. The problem of mobility is well handled in the inverter generators. They are portable and can be easily moved from one place to other. Though some of the inverter generators also come in the category of bulky generator still they come with an in-built handle and pair of wheels to support transportation. It's almost a decade, I left using conventional generators. There were many reasons for this decision but the one that really forced me was the capability of the inverter generator to operate very quietly. I love the noiseless ambiance and as a result, the quietness of these generators grab my eyeballs. The first time I noticed the inverter generator was at my friend's wedding. Even though the generator was operating from long-time, I could hardly find any noise coming out of it. When I started gaining information on this topic, I found out that all the inverter generators aren't as quiet as the one I found at my friend's wedding. Though some inverter generators make noise still they aren't loud enough to surpass your conversational tone and pitch. Allow me to share a secret with you. Most of the people think that the conventional generators are less costly as compared to the inverter ones. Before I throw some light on this misconception, I would like to know your views. Definitely, the buying cost of an inverter generator is more as compared to the conventional generator but most of the time, we forget to consider the operating cost which will accumulate to a big amount. I can assure you that if you are considering to use a generator for 5 years then, the inverter ones will be economical as compared to the conventional. The inverter generators are great at saving fuel as these generators have the capabilities to increase or decrease the engine speed depending upon the loads. I hope I have made my point and you are convinced to some extent. Moving further, we will discuss the important features that an inverter generator must have also, the best yet simple way to choose your quite inverter generator. 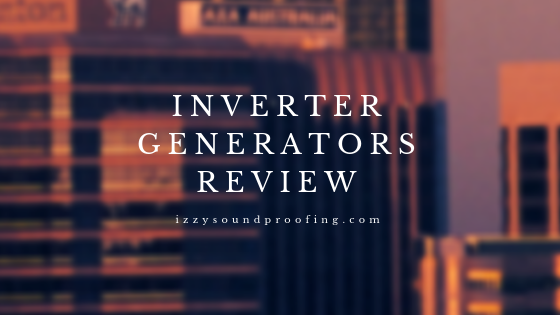 This section of the post is very important for those readers who aren't interested in the list of the quiet inverter generators that we have reviewed. It's perfectly ok, you may have a different requirement or budget. However, allow me to arm you with related knowledge so that you can take your decision in a better way. My intention is to help you select the best product that fits your bill. Noise Factor: You must be thinking that already I have discussed that the inverter generators are way ahead when it comes to quietness then, why am I again discussing the noise factor, right? The answer is more simple than you think. When it comes to the noise factor the inverter generators have a varied range. In fact, some of the inverter generators work within a range (48-51)dBA while others work at as high as (57-68) dBA. Different ranges cater to different requirements. Sometimes, noise factor may act as a decision parameter. You can find the noise rating either on the package or on the body of the product. Now, compare the two competing model to reach out to the buying decision. Moving further, allow me to share my experience. You need to keep in mind that one generator can't cater to all your needs effectively. For example, different noise level applies to different places and occasions. So, you need to keep in mind that a less quiet inverter generator can serve the purpose for house and office. However, you will need a generator that has decent noise factor when it comes to RVs. Definitely, if you are camping at night then, you need a very quiet generator. One thing I would like to mention here, there is nothing like a perfect "quiet". In fact, quietness is a relative term and the tolerance level is different for different people. Choose the product that doesn't make you uncomfortable with the noise it creates. How Much Power Do You Need From The Quiet Inverter Generator? Perhaps the most important factor in deciding on the budget of the generator. The inverter generator budget is directly proportional to the amount of power that you need to generate from it. Here is the trick. I have seen lots of my clients going with an inverter generator which has very high power generating capacity. But at the same time, I never found them using the generator to full of its capacity. I will suggest you, ask yourself a question, "Do I really need the generator with very high power generating capacity?". If this is the first time you are planning to buy an inverter generator then, allow me to help you with some rough estimates that you can consider while buying the inverter generator. A 1000-watt inverter generator is sufficient to take care of your daily household needs. Needless to say, you can run TVs, gaming consoles, small lights, fans, and electric razors. you have to look for an inverter generator which produces more power. If you are looking for an inverter generator that can be used for the coffee machine, BBQ grills, electric ovens and so on. Then, inverter generator with 2000 watt power can be a good option. Moving further, I would like to throw some light on the inverter generators with a capacity of 3000-watt power. These type of generators can run ACs worth 13,500 BTU of power. In short, these quiet inverter generators can take care of almost all power needs. It's sufficient for running AC in the RVs and also, it can take care of all power needs at a camping site. I have been personally using this inverter generator for my camping sites. It has performed way ahead of my expectation. Runtime Issue: In fact, this is a relative problem and may not be something that everyone has to deal with. Personally, I have added this section because I love to go on camping trips. So, if you are the one who is camping freak or who spend a lot of time in RV then, like me you may have faced runtime issue. The process is very simple. Either you are planning for a camping trip or you are spending loads of time in RV, you just need to calculate the runtime keeping various aspects in mind and then, look for an inverter generator that is capable of providing you uninterrupted power supply during that duration. It is quite normal that the longer is the potential runtime the more power you will need. You need to also keep in mind the fact that longer duration will need a generator which has a big fuel tank. If you are looking for an inverter generator that can provide you continuous power supply for 12 hours and more then, I will suggest you, go for EU3000IH1A. If you are tight on the budget then, you can try Champion 4000. Now, let's talk of a scenario where you have to manage a lot of accessories and you already have inverter generators with less capacity. In that case, you don't have to look for a generator with a high capacity. In fact, you can connect these generators together to generate more power. Before connecting the inverter generators, you have to keep two things in mind. The models and brands of the inverter generator that you are planning to connect must be SAME. You will have to use a connector kit for this purpose. Definitely, it will solve your problem of failing runtime. Is Your Quiet Inverter Generator Fuel Efficient? Whether it's bike or car or RV, most of us consider fuel efficiency as a key parameter for buying decision and, the same holds true with the quiet inverter generator. Another benefit of having a fuel efficient inverter generator is that it improves the runtime. The inverter generators have the ability to adjust their engine speed depending upon the amount of power it needs to supply. They come with an in-built microprocessor that takes care of adjusting the engine speed. By doing the adjustment, these generators save a lot of fuel. It is advisable to compare the performance of these microprocessors in "economy mode" and give priority to the one that saves the maximum amount of oil. 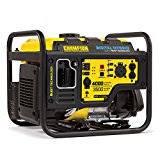 Is It Good Idea To Consider Portable Generator For Buying? This is one question very often asked by the clients. So, keeping this point in mind, I have reviewed a mix of heavy-weight generators and light-weight generators. If we talk in general, the powerful units are usually heavier. You will even find some generators are stationary and at the same time, very hard to move. I will not say the lightweight generators are better as compared to the counterparts and vice-versa. In fact, each of these generators is made to serve some purpose and if they are able to do so, then they are perfect in their own sense. Personally, I prefer the portable ones. These generators come with inbuilt wheels and attached handles. As a result, it is very easy to carry or transport them from one place to another. To make transportation easier, these generators are lightweight. You will not have to put too much strain on your back to carry them. Do Your Quiet Inverter Generator Has A Control Panel? Again it depends. I will not put this feature in the most important one but definitely, having a detailed control panel is a plus. Using a control panel, you can customize the function of the generator to exploit its full potential by providing specific commands. If you are a beginner then, you may some practice to get hang of it. At the same time, a sophisticated control panel shortens the learning curve as it is more user-friendly. I will suggest you, look for a control panel that has clear functionality. An unclear control panel can make it difficult even for a "pro" user to understand the full potential of the product. I forget to mention that most of the control panels come with innovative features and benefits. The control panel should be capable enough to tell about the different modes of product, fuel level, economy mode and, the power output level. A control panel with "touch" feature and also, multiple starting mechanisms can be a good choice. 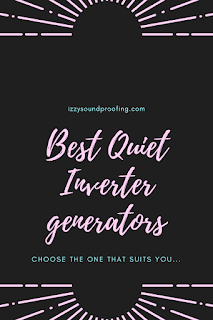 This is an important section for those readers who have already bought an inverter generator but unfortunately, the quietness of the inverter generator isn't up to mark. Trust me, it is an irritating as well as the frustrating moment when you bought something and it fails to match your expectations. So, I will be sharing some of the tips and tricks that will definitely improve the quietness of your generator. If suddenly your inverter generator starts making weird noise or it becomes louder then, there is a high probability that the muffler has stopped working efficiently. Replacing the muffler will improve the quietness. If you are buying the inverter generator for the first time then, you should keep in mind that replacing a muffler on a regular duration is a part of maintenance job to keep your generator quiet. At times, the vibration of the inverter generator can be irritating and, you may lose your concentration while exercising or performing some other task. The vibration sounds really weird. The first thing that you need to do is to check the engine housing for the unwanted vibration and then, add a rubber washer on the top of the engine block to dampen the vibration. If you have the feasibility to keep the inverter generator at a distance then, you can improve the quietness by doing so. In most of the cases, the smaller ones are quieter as compared to the bigger ones. It doesn't mean that you shouldn't buy the bigger and the bulky inverter generators. If you have a huge requirement of power supply on a large scale such as cover a big house or numerous home appliances then, you need an inverter generator with a high capacity. The best way to reduce the vibration and weird sound of a bulky inverter is to build a soundproof box encasing the generator. Last but not least, it's always advisable to buy two inverter generators of the same model and pair them together with a kit rather than putting too much strain on a single machine and overloading it. Before I move to the reviewing section, I would like to assure you that all the products reviewed in this post are either tested by our team or used by our clients. If we talk about the benefits of a quiet inverter generator then, it's countless. But here I am talking about the problem that you can face while operating an inverter generator. You can get rid of the first problem in a couple of minutes by simply replacing the conventional generator with a quiet inverter generator or you can make a soundproof box for a conventional generator. For me, it's the unwanted noise that most of the conventional generators create. Another problem that I have to face with a conventional generator was the voltage spikes and drops leading to a non-uniform supply of power to the home appliances. You may think this as a small problem but trust me, these voltage spikes at times can completely damage the appliances. However, the fluctuation of voltage can be controlled by using a stabilizer but again, I can't guarantee you the effectiveness of these stabilizers. Unfortunately, these stabilizers also have a capacity and beyond that they themselves get damage. But, the second problem is a bit tricky. To minimize the voltage fluctuation, I was on a look for a cost-effective reliable brand. Thanks to my team, their research and hard work finally paid off. We were satisfied with the WEN 56125i specification, features and, performance. Trust me, it's superlative quiet. If we talk about the most important part of WEN 56125i, that is, the engine then, it definitely looks quite promising. The engine is EPA ||| and CARB certified. At peak capacity, WEN 56125i can supply the power of 1250 watts. At the same time, under normal condition, the generator can supply a 1000 watts of power. Our team decided to perform some experiments to check the company's claim of providing the spikeless supply of power. So, we thought to check it a camping place and trust me, nothing can be a better option than a camp to check the companies claim. We provided power to the television, phone, laptop etc. They are known to create voltage spikes but fortunately to my surprise, everything ran smoothly and for a good duration. Do you have the same question that I had, "What's the secret?". 60cc motors. As a result, it successfully contributes to limiting harmonic distortions to 0.2765% when there isn't any load and at full capacity the limiting capacity increases to 1.1895%. So, you will NOT find the voltage fluctuation or spikes. You may have a question that what's the preparation for an unusual calamity? Well, the WEN 561251i is well prepared for that as well. It comes with an inbuilt "overload protector" circuit breaker that provides an additional layer of safety the WEN 561251i inverter generators. 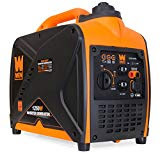 I have already mentioned above that I performed the experiment at the camping ground so it's needless to say, the WEN 56125i is a lightweight portable inverter generator. Weighing just above 31 pounds makes it a great choice when it comes to outdoor activities or camping. I don't want to either dive deep or elaborate but I can assure you that this generator can be a great choice for job sites. If you are a hunter at the core of your heart then, buy this generator for hunting as well as tailgating. I know I have partially answered your question, that is, the WEN 561251i is a quiet inverter generator but I haven't answered the question, "How quiet is the WEN 56125i?" If I answer, "It is very quiet" then, I think you will not take the answer as a complete answer, right? So, the best way to convince you guys is to talk taking some data into consideration. You can expect the WEN 56125i to make 51 decibels of sound from 21.738 feet if you work it to 1/4th of its capacity. If you want me to explain with a reference then, it's quieter than a window AC. In the layman language, the sound that this inverter generator produces is almost similar to having a conversation with someone in a normal voice. If you think I am done with answering your query then, you are wrong, in fact, there is more to it. Before I share some secrets, I will request you to have a look of this kit. Unfortunately, without using this kit we can exploit the next big opportunity that WEN 56125i have. I love the parallel compatibility feature that this inverter generator comes with. It means that you can pair this generator with other WEN 56125i using a WEN 56421 parallel connector kit. I wish it could have come as an accessory with this inverter generator but it doesn't and so, you have to buy it separately. I always try to promote an eco-friendly product. So, this product also comes with an "Eco-Mode". It helps to limit the use of gasoline when it isn't needed. Further, it also adjusts the fuel consumption level when we plug in or out the appliances that need to be powered. 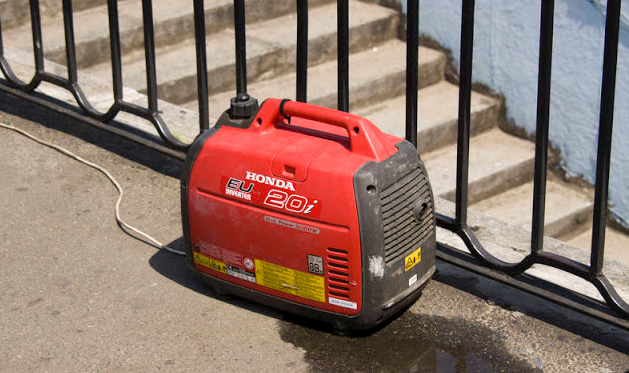 The "Automatic Shutdown" feature of this generator shutdowns the device once it is out of gas. It also has an inbuilt indicator light to let you know the generator is low on fuel or gas. Though a bit heavier as compared to the WEN 56125i still one of the quietest inverter generator available in the market. In fact, the "Open Frame" design is very intriguing to me. There isn't any doubt that the Champion RV inverter generator is one of the best choices for RV. I will go out of the way to recommend you this inverter generator if you are the one who spends a lot of time in RV. The manufacture of this generator has specifically added the features to target the RV audience, it may sound blunt to you but it's fact. As a team, we comprise a decade of experience and over a period of time, we have found out that the manufacturers have become smart enough to position a product to cater to a particular need of the end customer. Allow me to share a secret with you about the Champion RV Ready, there was a reason that "Open Frame" design came into existence. You may be wondering what am I blabbering, right? By using this design the manufacturers were able to reduce the weight of this inverter generator by whopping 20% as compared to the tradition Champion 3500-watt inverter generator. "Necessity is the mother of the invention". So, currently, the Champion RV Ready weighs 81.6lbs. By implementing the "Open Frame" design the company was highly successful in targetting the large customer base who are looking for a portable inverter generator for camping or RVs. Needless to say, It also outlines it's predecessor when it comes to noise reduction capabilities. I was very curious to know the noise that it generators when it is in operational mode. I also wanted to check the company's claim on its quietness. When calculated the sound was found to be 63.89 dBA approximately which is definitely way less as compared to the Champion 3500-watt model. If we talk in terms of percentage then, you will be astonished to know that it is 50% quieter than its predecessors. Seriously, I am NOT kidding? I am simply trying to present the data in the form of useful information. Hope this helps my readers. I forget to mention that this masterpiece uses a 240 cc motor. Definitely, it isn't as quiet as the WEN 56125i and if we talk in the perspective of the reference then, it's a bit louder when compared to the normal conversation. As mentioned earlier in the post, the product has been launched to target the RVs lovers. So, it has an inbuilt feature exclusive for RVs. Yes, it comes with an RV outlet of 12V(30A). If you are the one who is not taking serious this generator then, let me tell you some mindboggling things about it. This beast has the capability to deliver power up to 4000 watts. At a stable stage, it delivers 3500 watts of power and trusts me, this amount of power is more than enough to take care of all the power requirement of a mid-sized house with a good number of home appliances. I don't think anyone can tell me this better than my brother in law who is pretty well satisfied with the performance. A 12V DC adapter outlet and two USB ports for charging electric accessories definitely pump fuel to the optimum use of this generator. I just want to check the minimum distance after which the sound of this generator is almost ineffective. To get the best result, I simply start walking in the opposite distance from where the inverter generator was placed. Can you guess the distance? Well, after 24.73 feet away from the generator, I ended up with an almost whisper kind of noise. Well all said and done, I hope I am able to highlight the qualities of this generator. If I have to suggest this inverter generator for RVs then, the most important thing that I need to discuss with my readers and folks is the amount of time for which it can hold, right? Now, I am going to disclose the most important piece of information that makes the Champion RV Ready a perfect choice for the RVs and camping. This lovely beast has a gasoline tank of 2.9-gallon capacity. Can you feel the power of this capacity? Well, it can continuously run the generator for 17 hours at 25% load. I hope the camping and RVs related outdoor activities can be well-taken care within a time span of 17 hours. I will wait for your response to the above statement in the comment section. However, it will be an injustice to the review if I will not highlight the downside of this product. Trust me, nothing in this world has only PROS or positive sides, negative sides do exist and a well-informed consumer is one who visualizes the impact of negative sides on their requirements. You may not enjoy the recoil start mechanism. The cold days are tough. You will have to pull the cord "really hard" to get things started. Sorry, but its the dark truth about this generator and it is possible that it may impact your buying decision. However, men are well capable of executing it and ladies should be least bothered about it. If you don't have a problem with the recoil start mechanism then, rest is the cake walk for you. It comes with an inbuilt touch panel that gives you access to all the controls. You will be informed in well advance about the refilling need by the "Low Oil Indicator". It supplied sine-wave electricity will less than 3% THD. It is really an important parameter to check the capability of an inverter generator to manage the spikes and voltage fluctuations. Well, I am more than happy to share that the power will not spike abruptly and cause your appliances a sudden death. One of the important features of this inverter generator is the Automatic Load Balancing capabilities. Needless to say, that it winds down in "Economy Mode" when we free up the port by disconnecting the devices. Let me put an end to the boasting of this generator capability highlighting the last but very important feature. It is "parallel ready" which can help you to pair Champion 4000 with 2800-watt and above capacity generators by using the nifty connector kit and, the good news is that the connector is included in the package and so, you don't have to spend extra money to buy it. Are you convinced with the review, if yes, then buy it right away by clicking on my link? I will get a small portion as commission to sustain my team and produce well-researched content in future as well. Definitely, Generac is at par with its counterparts. There isn't any doubt that this generator is a great option once it comes to quiet inverter generators. 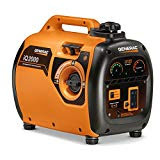 The Generac 6866 iQ2000 is bundled with features that are very helpful to a large population looking for a super quiet and efficient portable generator. Needless to say, the portable generators because of its size has a small fuel tank as compared to the traditional ones. The fuel tank of Generac 6866 is capable of holding 1.06 gallons of gas. Once you full the fuel tank, it can continuously run for 5.7 hours at 50% load. You can increase the run time of the Generac 6866 by decreasing the load. For example, if you will decrease the load form 50% to 25%, you will find a tremendous increase in the runtime. The runtime will increase to approximately 7.5 hours. It's CARB compliant and the engine grants a starting power of 2000 watts to Generac 6866. Once it settles down, the power stabilizes around 1600 watts. It's a perfect portable inverter generator for someone who is looking to power the appliances of a small to a mid-sized house. In short, the inverter generator is capable enough to take care of almost all the electric appliances power needs. Have I mentioned before that this generator is super quiet? If yes, then again I am emphasizing on the word "Super Quiet". To support my statement, I did a small experiment as I did for the last one. 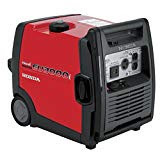 When the Generac 6866 was running at a 50% capacity, I started walking away from the generator and only stopped when I started hearing the generator sound almost similar to the mosquito humming. Well, the experiment was done to calculate the distance and fortunately, it was found to be as little as 10 feet. Though I recommend Honda generators still I can say you that it was almost 50% quieter than the Honda counterpart, isn't it a markable achievement? The test was conducted by a third party between Generac 6866 and Honda EU2000i and unexpectedly the results were astounding. Generac 6866 won the race and was considered quieter at 50% load. The design is user-friendly. The process is very simple. Just you have to simple dial to start, operate and, close the machine. Unlike to its counterparts, it comes with 3 modes of powers. To keep the normal electric appliances running, standard mode is more than enough. If you are running tools that use less power then, it's advisable to switch to "Economy Mode". I hope you would have definitely guessed the use of the "Turbo Mode". In the layman language, it helps you to go an extra mile. I will suggest you, switch to this mode, if you need the power supply for the heavy device. I just want to highlight the fact that the level of noise will also vary for the three different modes. The LED dashboard helps you to keep a track of the vital stats such as fuel level, remaining runtime and so on. The "Power Bar" tells about the current level of power dishing out from the generator. To meet the end customer expectations and to catch up with the competitors, the Generac 6866 has four indicators. Two of these indicators tell you when you are low on fuel and oil and the other two tell you when the machine is on the verge of overheating and there is a possible threat of overloading. Just to discuss in terms of reference, you can easily run a refrigerator using this generator. But the same doesn't hold true with the RVs. If you want to run an AC using this inverter generator then, the best thing that you can do is to pair an additional Generac 6866 with your generator using a connector kit. Fortunately, the manufacturer's are kind enough to include the connector kit with the product. Let me know your views and feedbacks for this particular product by sharing your experiences in the comment section. It will help my readers including my team. Finally, I am going to review my favorite and perhaps, the quietest inverter generator that I have come across till date. Trust me, the Honda EU3000IH1A is way ahead of my expectation. In layman language, I can say that Honda nailed the idea of the noiseless inverter generator. I will request you to be patient as I will be reviewing this product in detail. It is a portable device with mindboggling features. Needless to say, it is costly as compared to almost all its competitor but I can assure you that It's worth every penny that you will spend on it. Here, I also want to highlight that it is heavy as compared to other inverter generators in this range. It weighs 80lbs. It is user-friendly and setting it up is quite easy. The manual is self-explanatory and you can easily fuel it up and start it on your first try. To make it easily transportable, the manufacturer has attached wheels at the bottom of the unit. It also comes with two folded handles. A question will definitely come to your mind like it came to mine. If I am paying so much for this unit then, it should be perfect and trust me, Honda EU3000IH1A is. Let's talk about the power it supplies at a stable condition. The power that it supplies is way ahead of the competitors and it is 2800 watts. With this power, you can run Air Conditioner in your RV. Further, you have the standard AC port of 120 V and DC port of 12 V which is sufficient to run AC, laptop, lights, and other electric accessories. The Honda EU3000IH1A is very convenient and flexible to operate. This is a battery operated inverted generated which needs to be recharged on a timely basis. It has two switches, that is, ON and OFF. When you ON the switch, it kicks the ignition system into gear and thus, open ups the fuel valve. On the contrary, the OFF switch shuts down the engine and close the fuel valve. It also has an option to kick start manually. This lovely beast also comes with an inbuilt choking chord. You can start the machine by pulling the cord hard. It is advisable to refuel the machine outdoor and never refuel it when the machine is hot. There is a huge probability of catching fire due to the highly flammable nature of the gasoline. At the maximum or full load, it produces a noise of 65 dBA. If we talk in terms of reference, then this noise is almost equal to the human conversation. Stand a few feet away and, you will NOT at all hear the noise. Trust me, not even a sound similar to mosquito humming. The Honda EU3000IH1A is the best choice for the job sites and RVs but at the same time, you can also use it for your home power back up. Now, I am gonna highlight the most important feature of this inverter generator and it is "Eco-Throttle" mode. Simply turn it ON and let the machine take care of the loads. The Honda EU3000IH1A will dish out power according to the load. Last but not least, it can continuously run for 7.5 hours and more depending upon the load. The Yamaha EF2000iSv2 is a good option if you are looking for a small inverter generator. This inverter generator is lightweight and highly portable. If your requirement is a good amount of power then, definitely this generator isn't for you. For all those who don't know, the Yamaha EF2000iSv2 is an upgraded version of EF2000iS. It weighs just 45lbs and can power upon a good number of electric appliances. It takes just 2.2 cubic feet of space. It comes with Pulse Wide Module technology that keeps the voltage fluctuation to 1%. Also, the frequency is stable. This inverter generator is highly efficient in cold seasons as well. To handle the demand oh high electric supply, the Yamaha EF2000iSv2 increases the engine's speed. It comes with USFS-approved spark arrestor which doesn't allow the noise to exceed 61 dBA. Needless to say, an increase in the load will increase the noise. Switching through different option is quite simple and easy. You can get to "Economy Mode" as per your need. It can provide you the surge power of 2000 watts and steady power of 1600 watts. At 1/4th load, you can expect the run-time to be approximately 10 hours. It also comes with an "Overload Indicator" which adds to the safety of this inverter generator. Whenever there is an overload, the indicator will signal you to reduce the load. Similar to the counterparts, it also comes with a "Fuel Indicator" which tells you about the amount of fuel that is present in the tank. It is also "eco-friendly" as it is CARB and EPA certified. I hope it's a well-balanced package that you should definitely take home. Before we conclude, allow me to share with you the link of some mindboggling product review posts. I am wondering if you had really made to the end of this long post on best quiet inverter generators. Thank you for being patient. To conclude, I would like to say that the concept of one size fits all doesn't work here. I can guarantee you that no company can manufacture a single product that caters to everyone's need. In fact, the word "Quiet" is relative. The meaning of the quietness for me may not be the same for you. So to summarize, the brands like WEN and Generac emphasizes more on providing clean power and quiet operation. Almost all the product that we have reviewed in this post has a detailed control panel which is also self-explanatory. However, if you want to go for a complete package then, Honda EU3000IH1A is the right choice. If you are the one who is more concern about the power then, Champion will be my suggestion. However, you will have to take some measures to minimize the noise. For example, you can get one soundproof box for your generator. At last, I just want to say that if you couldn't find the product of your choice then, you can exploit the characteristic section of this post to get a rough idea of what all you should look for before taking a final call on an inverter generator. Feel free to share your view about this post in the comment section.